Did Disney’s CEO Just Tell Us Who The First Star Wars Spinoff Is About? Here at Giant Freakin’ Robot, we understand how the rumor mill works, and we have a massive ball of salt grains that we roll out whenever necessary. But we think we have a good idea on who the first Star Wars spinoff is going to be about, at least in a roundabout sense, and this tidbit didn’t come from Random Twitter User @ForzAwakenz or anything like that. It came from Disney CEO Bob Iger, who says Gareth Edwards’ standalone film in the Star Wars franchise will be based on characters from The Force Awakens. Iger, who has gotten his hands and eyes on a large chunk of The Force Awakens, managed to reveal more about the future of Star Wars at one time than almost everything we’ve learned in the last two years. His relatively in-depth thoughts about The Force Awakens and beyond come from an annual report from Disney, which was shared by Get Your Geek On‘s David Gremillion, who is a Disney stockholder. Give it a read and then we’ll break it down a little further. Yes, Devil’s advocate, I realize that by saying “these characters,” Iger could be talking about the royal “these characters” and just loosely implying that the first Star Wars spinoff will be based on Star Wars characters. But he says it in the middle of talking about The Force Awakens and right before he brings up the second two films in the third trilogy. The gut feeling is strong with this one that he’s talking about taking one of the soon-to-be-established people and jettisoning them off into another adventure, which recently landed About a Boy screenwriter Chris Weitz. Which, I might add, could tie in with one of the other previous rumors that claimed this will be a heist film with a new character. What’s more, Iger says that Rian Johnson’s Episode VIII will hit theaters in 2017, which has been covered, and that Episode IX will “finish this trilogy” in 2019. It’s another slice of wording that perks ears, as one has to wonder whether there will be more trilogies to follow once this one is complete. Oh yeah, and Iger happened to like the footage that he saw. But that’s to be expected. 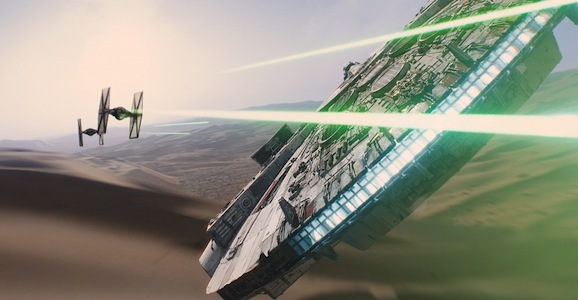 Star Wars: The Force Awakens hits theaters on December 18. You may have read between the lines a bit too far there. ‘These characters’…Don’t forget there are a good 6 people from the original trilogy that are in it too, meaning a spin-off could still be about Han / Chewie / Leia etc. and not about new ones.